Blended and personalized learning holds tremendous promise for meeting the individual needs of our students and deepening their learning. Unfortunately, in the rush to implement these models, we often overlook the needs of those responsible for putting them into practice: the teachers. Whole model implementation is an overwhelming endeavor because it involves significant changes to a multitude of practices and conditions. As an educator community, we need to think differently if we are to increase the likelihood of successful blended and personalized learning shifts. A proposed solution is to focus on the concept of personalized teaching: meeting teachers where they are in their practice, identifying relevant and accessible blended learning components based on teacher context and capacity, and strategically and incrementally bridging towards a comprehensive model. Personalized teaching focuses on the process of implementing blended and personalized learning from the teacher’s perspective and emphasizes flexibility, modularity and sustained support. It values the mastering of model components and partial implementation. This approach is more accessible for teachers, allowing them to customize and modify models to meet their needs, focusing on components and adapting their instruction over time. It was Taylor’s* second year at Leadership Public Schools (LPS), a network of three public charter high schools committed to increasing equity in education through innovation. Despite a difficult first year, Taylor wanted to grow as a teacher, and took on a new program called Navigate Math, an intervention course we developed to accelerate learning and build ownership using a personalized learning approach. However, even in the second year at LPS, Taylor’s biggest developmental priority was working on classroom management. If a teacher cannot even ensure all of their students are in their seats at the beginning of class, how can they expect to use the course’s real-time data, self-paced learning, cooperative teams and tasks and reflection and goal-setting on different competencies? This type of scenario is precisely why LPS designed Navigate Math for personalized teaching, starting with intentional flexibility to maximize access for different teachers. The Navigate Math program does not expect complete implementation of its model from the beginning. In fact, it does not start with personalized learning; it begins with direct instruction and common pacing for its first two units. This provides teachers and students a familiar place to start from, and the time to collectively build essential skills and habits for blended learning like note-taking from different resources, organization, time management and cooperative learning techniques. This gradual release helps teachers as much as it helps students. In Taylor’s case, it leveraged intentional flexibility to continue direct instruction and common pacing months longer than colleagues before switching to self-paced learning in order to focus on management first. Taylor made changes to the open-source digital curriculum to support this approach using Gooru’s Learning Navigator, a learning platform co-designed by Gooru and LPS. With the start of the second semester and big wins on classroom management, Taylor considered which personalized learning practices to develop next. After consulting with colleagues, Taylor decided to focus on using real-time data to pull individuals and small groups for targeted support while the rest of class worked at their own pace. By the end of the year, Taylor made permanent gains not only in classroom management, but also on real-time data use and small group instruction. While Navigate Math’s practices are complementary, they are not wholly dependent on each other. This modularity allowed Taylor to incrementally bridge practice in manageable, personally relevant ways, with impressive gains in professional practice and student outcomes. By the end of the year, students in Taylor’s Navigate Math averaged over 2.5 years of growth in a single year, according to NWEA’s Measures of Academic Progress test (the overall cohort of teachers, Taylor included, averaged 2.8 years). Taylor trained on Navigate Math at the beginning of the year but support did not end there. Sustained support throughout the year is a crucial part of personalized teaching, which took two primary forms in Navigate Math. First, colleagues had common resources and tools to meet their individual needs. Resources included editable, open education resources and self-serve professional development materials embedded in their curriculum by practice. The Learning Accelerator’s Practices that Work site is an outstanding example of this organization by practice and includes a case study on Navigate Math. Common tools included the flexible and modular curation, assessment and data analysis components of Gooru’s Learning Navigator. Second, teachers attended bi-weekly, one hour Google hangouts that focused on specific problems of practice. Regardless of where teachers were in pacing or methods, each had a means to explore solutions to their challenges and practices together that went past having a diversity of tools and curricular resources alone. 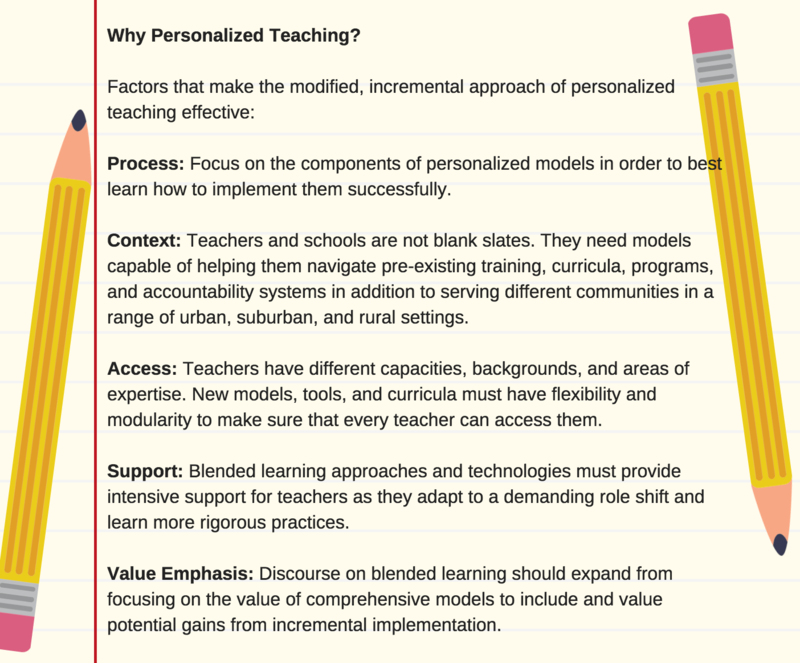 Personalized teaching expands the blended and personalized learning conversation beyond tightly focused comprehensive models, emphasizing the value of incremental approaches. It incorporates flexibility, modularity and sustained support in models and technologies before moving teachers to full implementation. It recognizes that, like students, teachers break things into parts, master them and then add more. It plans ahead for helping teachers adapt models to their current contexts, navigating the systems and requirements from prior reform efforts. Personalized teaching recognizes these realities, increasing teacher access to change and the likelihood of systemic improvement and increased equity in education. Though written twenty years ago, David Tyack and Larry Cuban put it well in their 1995 book Tinkering Towards Utopia when they say “reforms should be designed to be hybridized, adapted by educators working together to take advantage of their knowledge of their own diverse students and communities and supporting each other in new ways of teaching.” Doing so will maximize our ability to reach the full potential of blended and personalized learning, for both students and teachers.